One reason to go to Jaffa's to eat is for their fish restaurants. We were looking for a good one and we fell in love with this Jaffa look-and-feel fish restaurant (and the local presence also hints that). 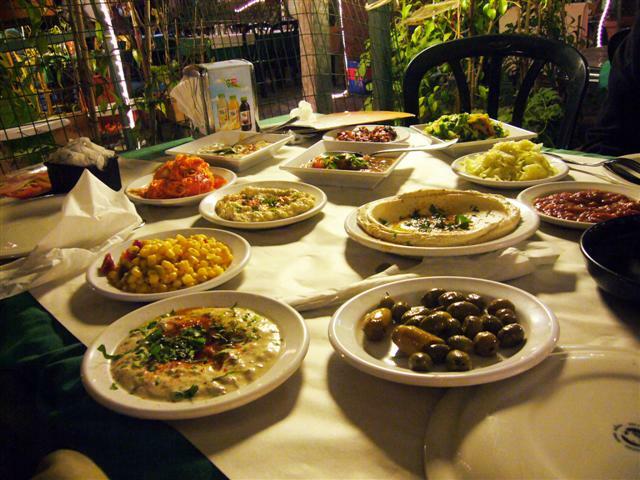 The traditional way in these fish restaurants is to order the fish and with it you'll get plenty of yummy mezes - such as: humus, tehina, fries, eggplant salad, pickled salad, cucumber salad, carrot salad, olives and pickles, parsley salad, tabbouleh salad, spicy tomato salsa etc. You'll also get some bread and pita and everything can be refilled all the time. Watch out though, do not fill your stomach before the fish is served! (a common mistake of beginners). The fish (a whole fish, not a fillet) can be grilled or deep fried (grilled is a better choice). We took a sea bream and a European Seabass, and enjoyed the latter more. By the way, you can easily share a fish dish with two persons, but one person will have to pay 30NIS for the salads. This is still very much worth it. 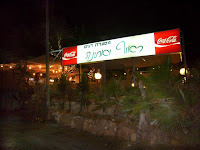 In Kedem st. you have some other famous fish restaurants, including the nearby Hazaken ve hayam (the Old Man and the Sea). Although it's quite popular and offers more salads then Rauf et Atina, we think is less in quality and less tasty. If you are a looking for another fish restaurant (which is also not that far into the margins of Jaffa) try Abdu Hadayag. We are sorry to say that we didn't find any convenient way to reach this street with public transportation. A taxi from Tel Aviv center should be about 40-45 NIS. Click here to view location on the map (for driving instructions, use the map's 'directions' feature). Yeah nothing like fish restaurants in Jaffa. Nothing pretentious in it and some might find these places dirty. But it's not! enjoy it all. A terrific restaurant. Very good food. Most generous and kind host. We often take there our guests. Also, lovely to visit there with the kids. It worth the 30 min. driving from Rehovot. OK, good fish restaurant . But... the mezzes were basic and the welcome very standard. The old man and the sea, 10m away has the same fish, better mezzes, free lemon juice and more smiles.